Garry Kasparov is the best player in the history of chess. His rise to the top was meteoric and at his very first attempt he managed to become World Champion – if one does not count the aborted title match of 1984 as a failure. He is the youngest World Champion of all times. From 1985 to 2000 Kasparov kept the title – for 15 years – defending it against Anatoly Karpov, Nigel Short, and Viswanathan Anand, until he finally lost it to Vladimir Kramnik. But even as an ex-champion Kasparov dominated the international chess scene and was first on the FIDE ranking list until he retired from competitive chess in 2005. In October 2012, when this DVD was recorded, his record rating of 2851 is still unsurpassed. Kasparov divides his career into three phases: his rise to the top (1973 to 1985), the time as World Champion (1985 to 1993), and the time from the break-up with the World Chess Federation until his withdrawal from tournament chess (1993 to 2005). His model for selecting the games is Bobby Fischer and his book "My 60 Memorable Games" – like Fischer, Kasparov does not only select games he had won. 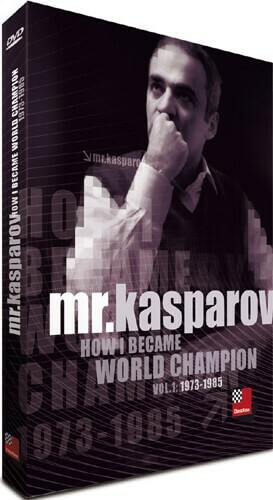 This DVD – containing 16 chapters and running for more than six hours – gives you an opportunity to follow the development of the best player in the history of chess, all told and explained by the champion himself. You get a first-hand account of crucial events from recent chess history, while at the same time you can improve your chess understanding and enjoy explanations and comments from a unique and outstanding personality on and off the chess board.